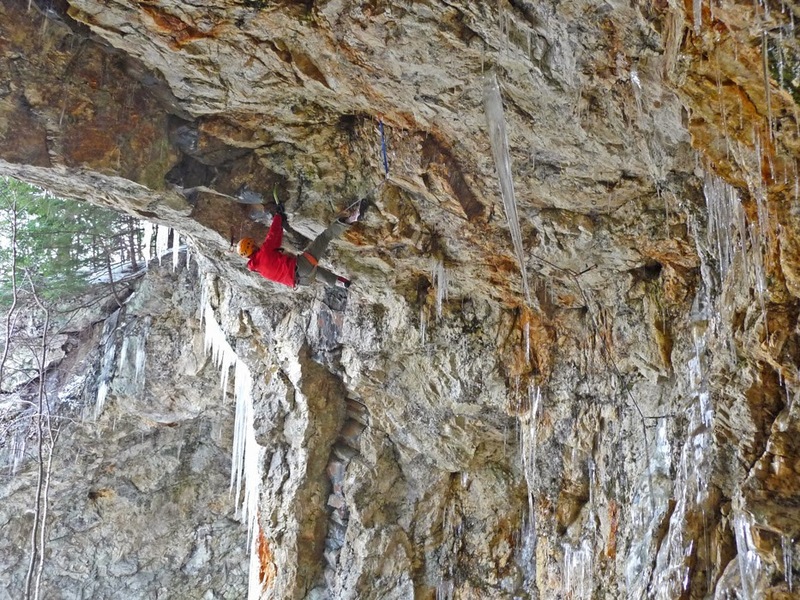 I think it's safe to say that modern mixed climbing has fully arrived in the northeast. There are now multiple areas that have radically overhung routes that include both ice and rock climbing at a very high level of difficulty. Exit 30 Crag in the Adirondacks, Snake Mountain in Addison, VT, the Cathedral Cave, Toko Crag in Madison, NH and the Mica Mine in Evans Notch all have amazing modern mixed routes. 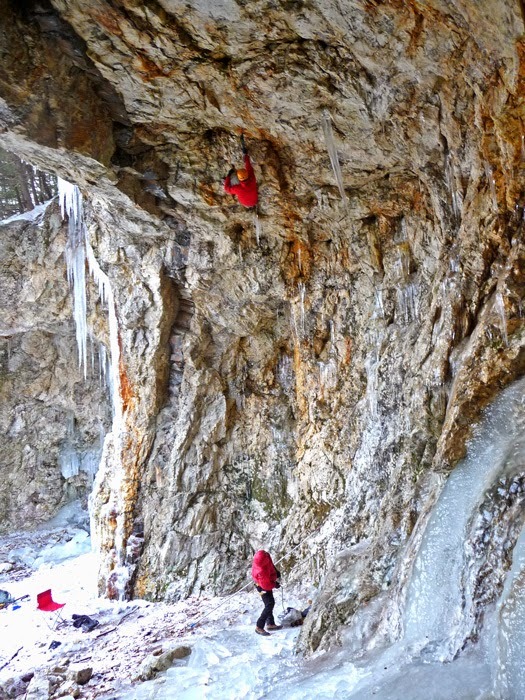 Many of these routes are bolt protected and fruit boots and modern mixed climbing ice tools are pretty much required. I know, the traditionalist in you is saying this is silly. Well, it is. And it isn't - the climbing is hard, and a lot of fun. I had the opportunity to check out the Mica Mine in Evans Notch a few days ago. I went in there with Matt McCormick, Josh Whorley, and Jeremy Dowdy from Vermont. Bayard Russell and Anne Skidmore met us there later in the day. Bayard and a few other North Conway are locals have been very active in the Evans Notch area. Our first impression was "whoa, this rock looks like crap". It is. But it turns out that the climbing is really fun, and no one's going to complain about the high quality rock being scarred by picks and crampons. 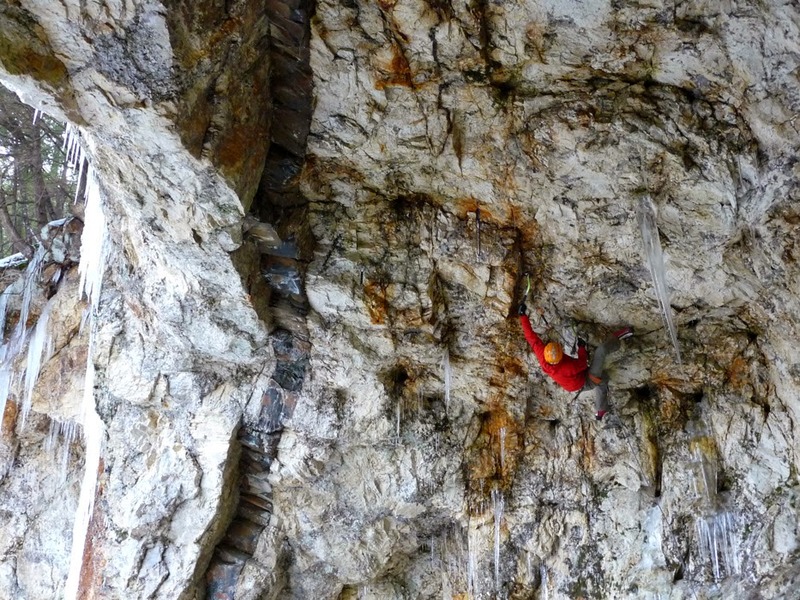 It turns out that it's the perfect type of place to put in hard mixed routes.